All the accessories you need to connect an IP video surveillance system. IP cameras connect to a LAN through a network cable. To create a LAN you need at least one switch to connect the cameras. To easily cover large areas you can use several switches connected to each other. 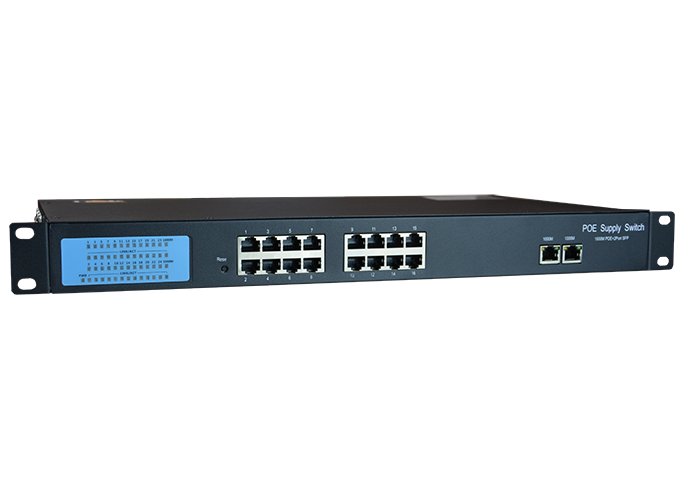 Our POE switches are not ordinary computer switches, but are specifically designed for video surveillance networks. This is why they are ideal to make secure and reliable networks on which you can base your IP video surveillance system. 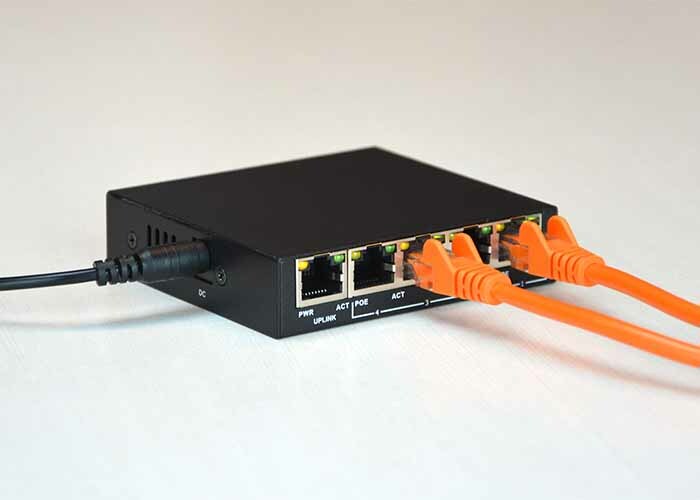 Below is an example of a small IP network; please note the POE switch that allows you to connect two cameras. 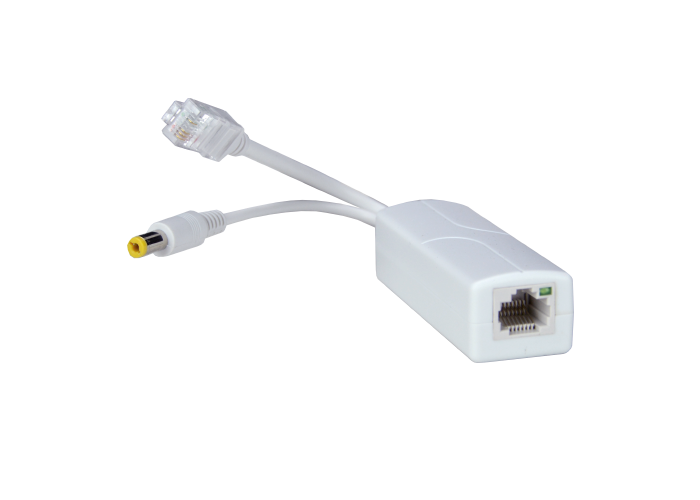 Thanks to the Power Over Ethernet (PoE) technology, the IP cameras are powered just through the network cable and do not need a separate power supply. This is one of the main advantages of the IP CCTV compared to traditional analogue systems. The POE power supply is defined by an international standard (IEEE802), so with our POE switch you can power any compliant device, even from other manufacturers. Almost all of our IP cameras, including many motorized models, are suitable for POE . If your camera does not support POE power supply, you can add it yourself by adding an external POE splitter. 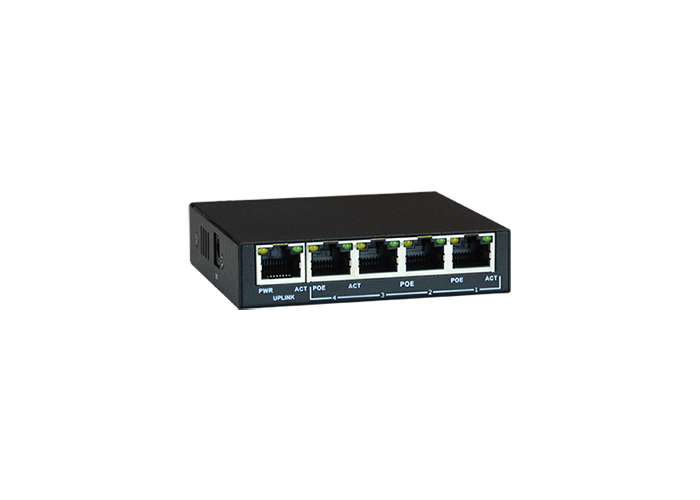 This range includes switches with 4.8 and 16 RJ45 POE ports. 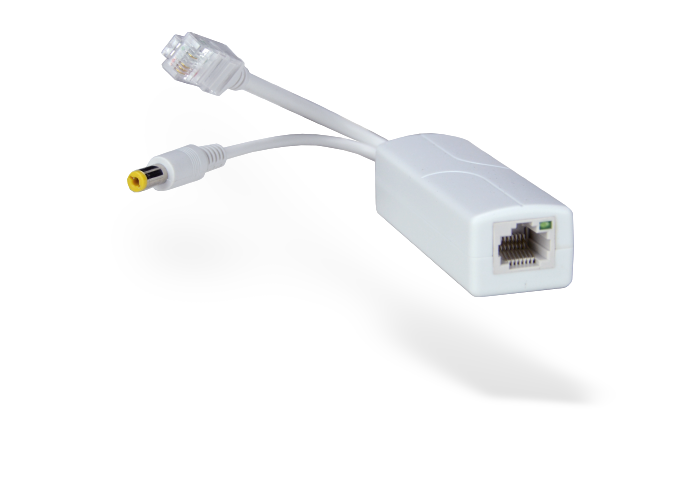 Each port can supply Power Over Ethernet to a camera. You can connect any POE camera (IEEE802.3af 15W) and even motorized POE + cameras (IEEE802.3at 30W) because each port supports both standards. Of course you can also connect devices that do not require power, such as a PC or NVR. 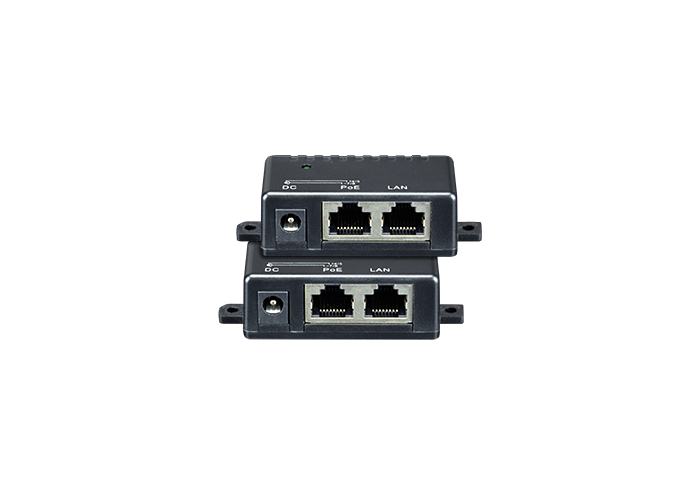 In addition to the POE ports, all switches also have one or two UPLINK ports for the incoming LAN. Each port has two LEDs that indicate POE power and data. This range includes 10/100 and 10/100/1000 switches. 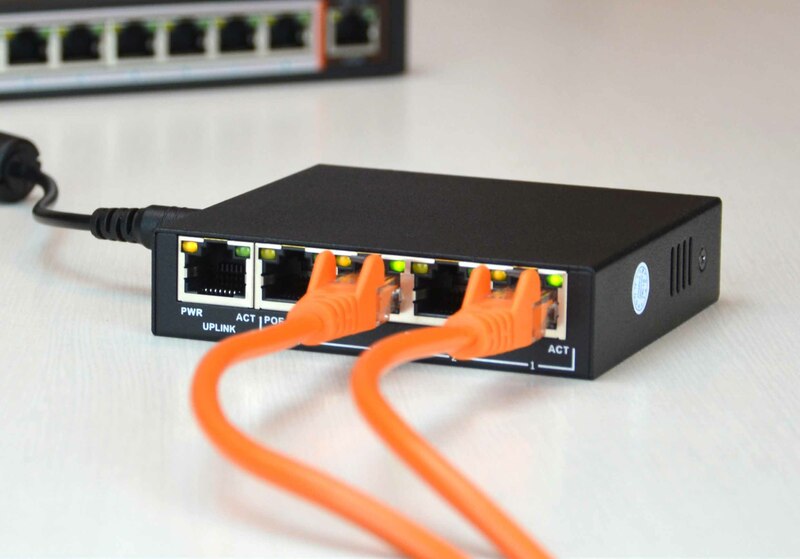 The 10/100 switches can handle a maximum data transmission speed of 100 Mbps. 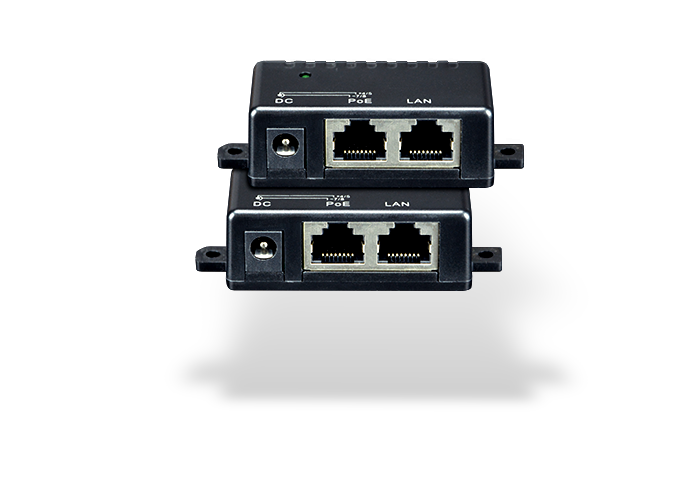 They are ideal for the connection of IP cameras that also have a 10/100 network interface and takes less than 10 Mbps each, depending on the video streaming setting. If the band to be handled exceeds 100 Mbps you have to use the 10/100/1000 switches, also called Gigabit switches. For instance, you should use a Gigabit switch when you need to connect other switches, each with a certain number of cameras. 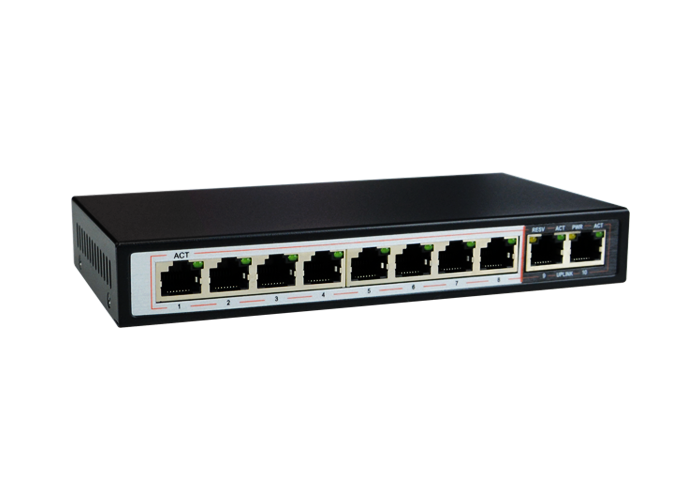 Some switches have 10/100 ports for the cameras and 10/100/1000 uplink ports to communicate faster with upstream devices. The cameras connect to the switches with UTP cables. The most popular ones are UTP CAT5. Before buying your cable you must check that they are made with pure copper conductors because the cheap CCA conductors won't work. 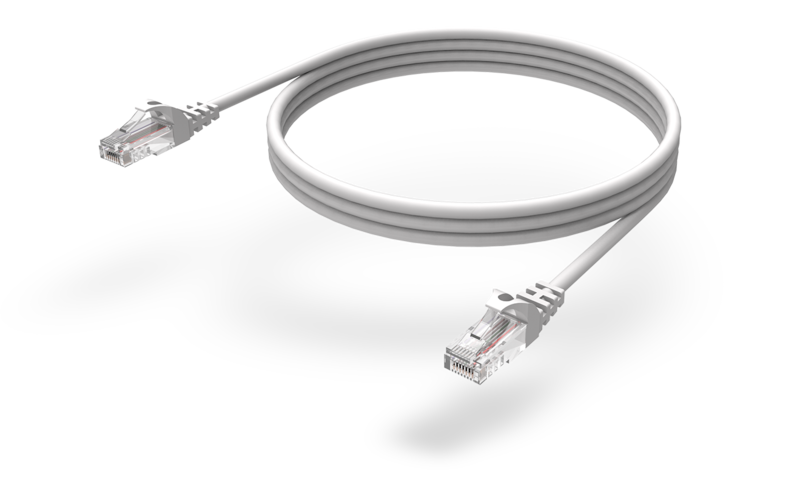 If you want your system to work properly with standard POE you should not exceed 100 meters cabling. Some switches in this range come with the EXTENDED POE function which allows you to reach 250 meters. If you enable this function the maximum bandwidth per channel cannot exceed 10MB. This is usually enough for an IP camera. According to the IEEE802 standard, POE switches supply 48VDC power. Our switches supply power only to devices that can support it, so there is no risk of damages due to incorrect power supply, that are unfortunately quite frequent in analog systems. Each port can deliver up to 30W and can power any camera, including PTZ cameras with IR that take high power consumption. Be careful that all cameras power consumption should not exceed the maximum power that the switch can supply: 60, 96 or 150W depending on the models. An average camera with IR requires between 6 and 8W so most of the time you can use all the POE ports without worry. Almost all the switches in this range come with two patented functions called AI QOS and AI POE. These are two video stream supervision functions, specifically developed for video surveillance systems. These patented functions allow the network to take actions when abnormal events occur. AI QOS supervise the data transmission of the channels and if a camera shows difficult transmission, it gives it more priority. AI POE performs automatic camera reboot if the video signal is missing or unstable. These POE switches are ready to work. They do not require any configuration or addressing operation because they perform all the functions automatically. All switches come with 48VDC power supply and include a protection circuit capable of protecting against overvoltages up to 6KV. Our switches are silent, fan-less and small in size. You can easily place them in junction boxes, cabinets, false ceilings etc. to bring your network anywhere. The 16-port models can also be rack-mounted, with the brackets included. 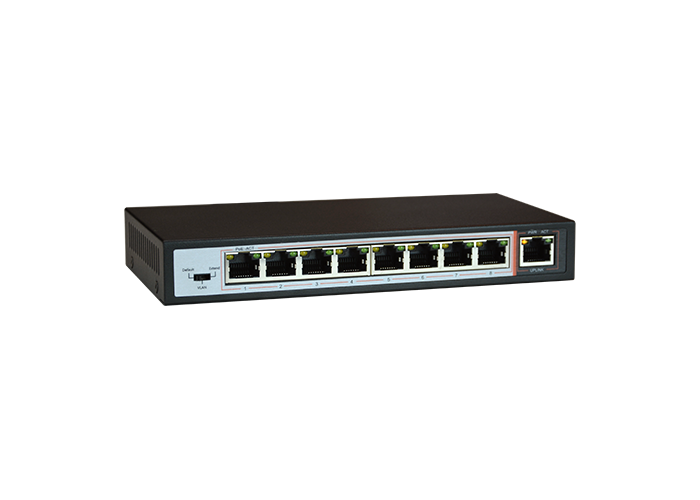 If your switch is an ordinary computer switch, or a router, probably has no POE ports. 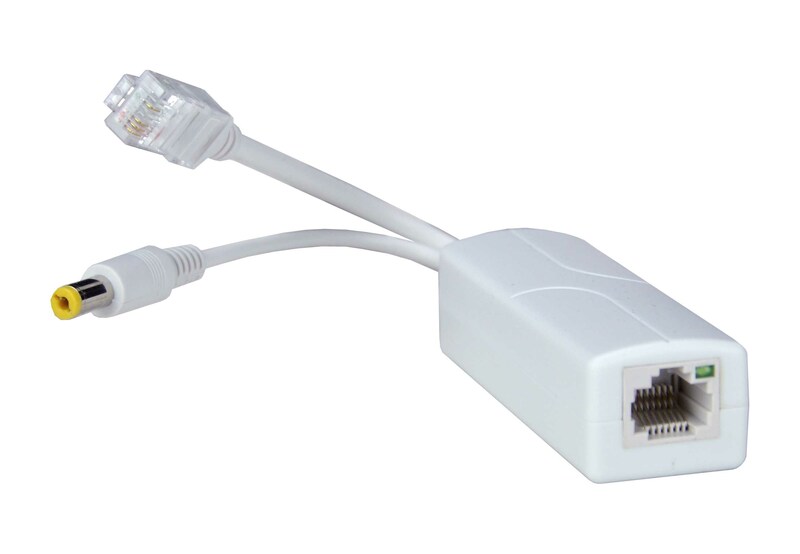 If you want to connect an IP camera, without using power adapters, you can buy a POE injector which, "injects" power into a line that does not have it. 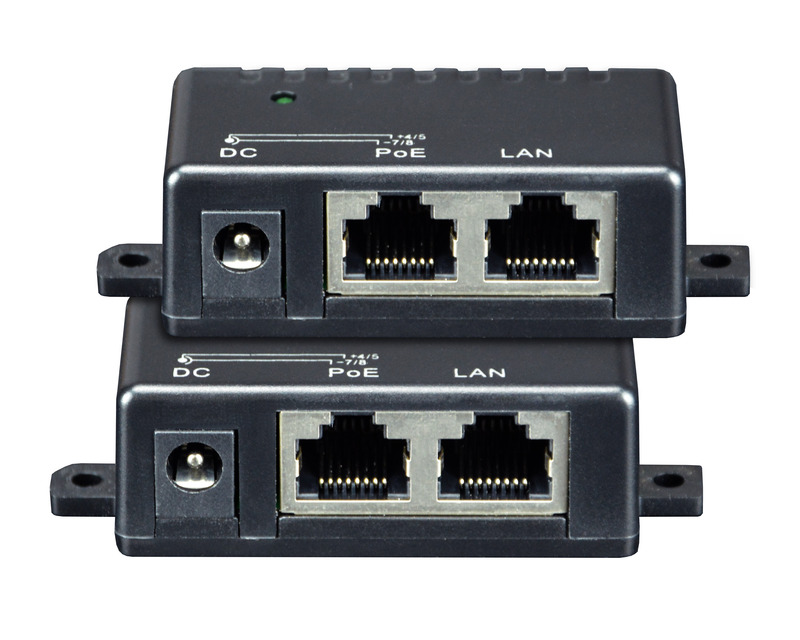 These POE injectors have two RJ45 network ports. 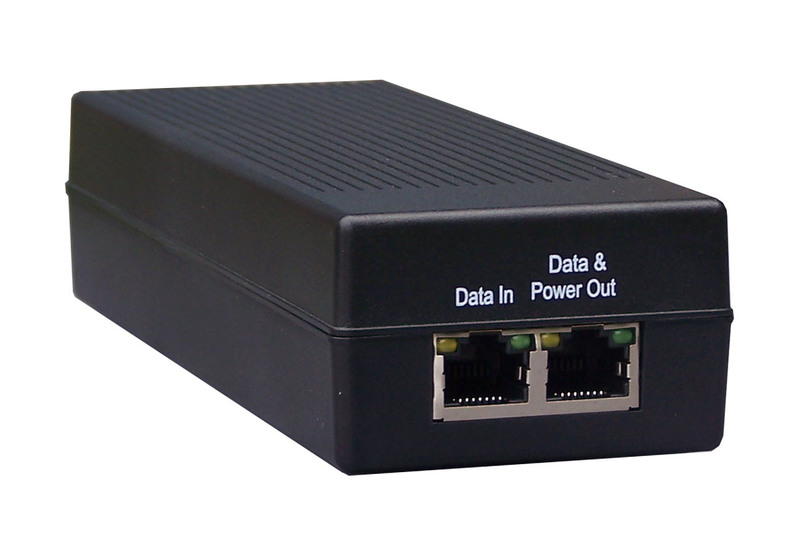 The network gets in without power supply, through the input port, and comes out with POE power, towards the camera . These injectors support both 10/100 and 10/100/1000 network and provides IEEE802.3af / 3at POE power up to 30W for all cameras, including PTZ ones. Each injector must be connected to the 220V mains with the cable included. Due to the small size, some of our IP mini-cameras cannot include the POE circuit and must be powered at 12VDC with an external power adapter. If the camera does not support POE power supply, you can still power it from a POE line using a SPLITTER. 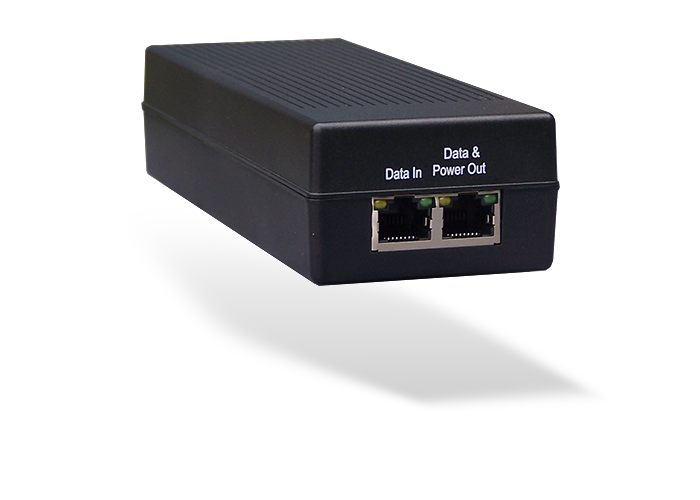 The POE splitter is a small unit that does not require its own power supply and is placed near the camera. 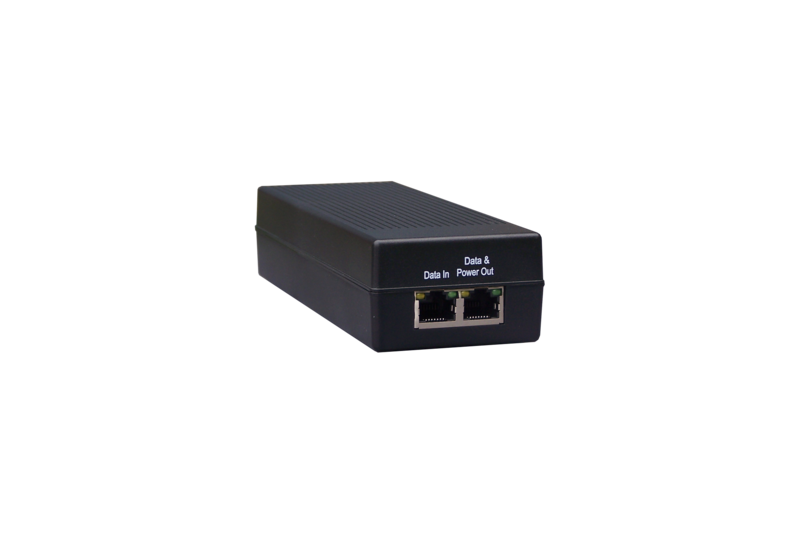 It receives the network with POE power supply and provides the cameras with the non-POE network and a separate 12VDC plug. The splitter supports 10/100 lines and is suitable for all of our fixed cameras. You can't use it, however, with motorized cameras due to high power consumption. If neither your switch nor your camera support POE power, you should power the camera with a separate 12VDC power adapter. If you want, you can carry the 12VDC power supply together with the data, along the network cable with our 12V Injector-Splitter. This product is made of two identical blocks that must be wired at both end of the cable. Each block has a DC plug and 2 RJ45 ports to connect the passing-through network cable. You must connect a 12VDC power adapter to the upstream block while the block close to the camera is suppling power to the device. The power adapter is not included and you can choose one from our power adapters. Is a normal switch fine? 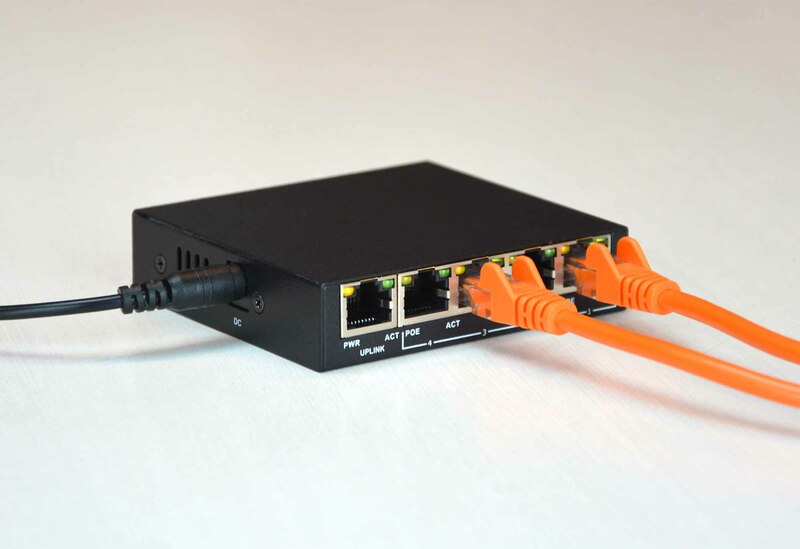 Of course you can connect IP cameras to a generic Ethernet switch or directly to the router. However these specific switches for video surveillance offer you many advantages. 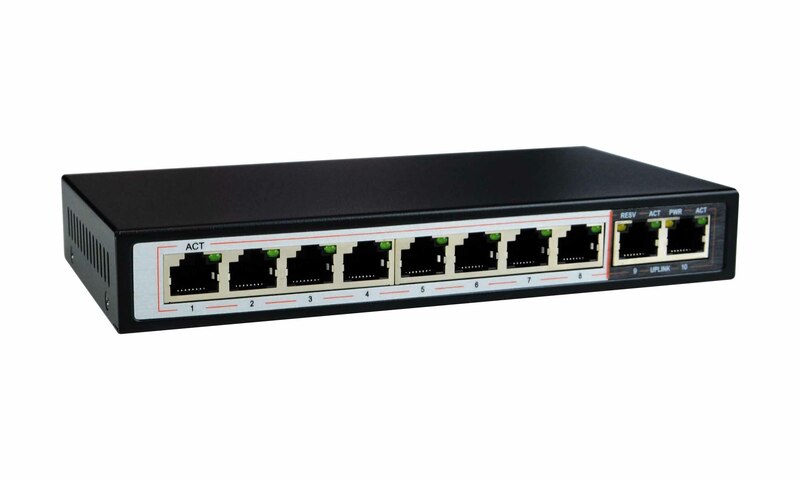 In our switches all ports are able to supply power , while normal switches usually do not provide POE power supply or make it available only on a few ports. A generic switch is also not supporting POE + power supply which is essential to power motorized cameras. 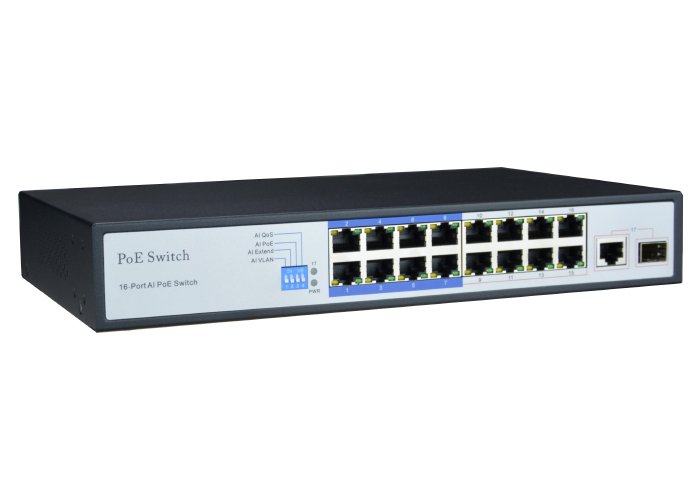 Our switches are also generally smaller than normal ethernet switches to be installed easily in cabinets and boxes. Finally, thanks to the patented AIQOS and AIPOE technologies, these CCTV switches can monitor the video stream and react in the event of abnormal situations. You can find the prices of our products in the Online Price List or in the CCTV STORE, our e-commerce portal.